Do you like the idea of this industrial brick wallpaper with its urban vibe…but feel like it might be too urban for you? Are you just not sure? It’s definitely not for everybody. Those who like it, LOVE it (I’m in that category, but I’m totally biased)! I spend hours each month collecting customer photos so that you can get a feel for how this brick wallpaper looks in other homes and offices. Just scroll down for some major inspo! Sorry for the totally boring stock photo of this wallpaper, but I wanted to show it to you without furniture in front on it. So that you can see there is no repeat pattern that you usually find with standard wallpaper – you know, when your eye sees the same pattern on a wall over and over. That’s because this is actually a MURAL that just happens to be wallpaper. 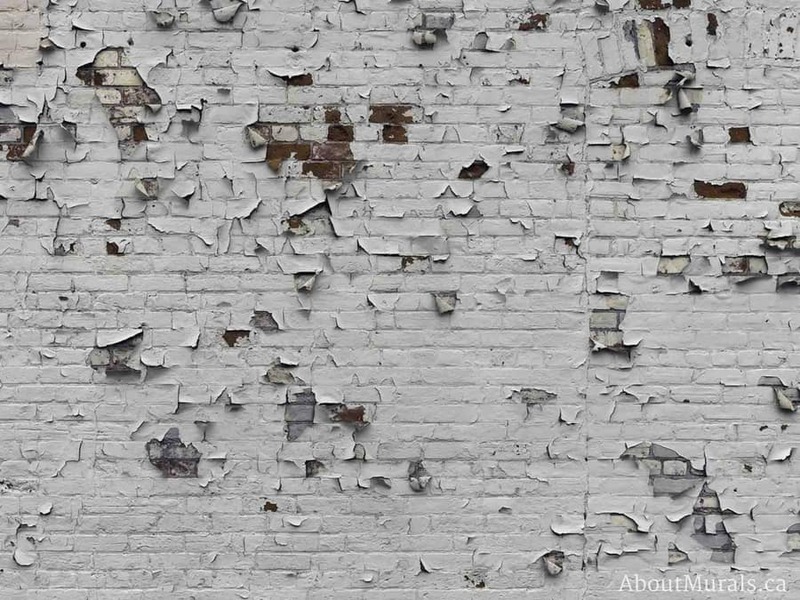 It’s made from a high resolution photo of a real brick wall. A totally realistic looking industrial brick wallpaper. You might not believe me, but all my brick wallpapers are so crisp and clear they almost look real. Even Colin and Justin think so…they say so in their Cityline TV episode. A photographer takes 74 small, separate photos of a real brick wall and then stitches them together in Photoshop. This creates a super high resolution image that is perfect for printing in large scale. 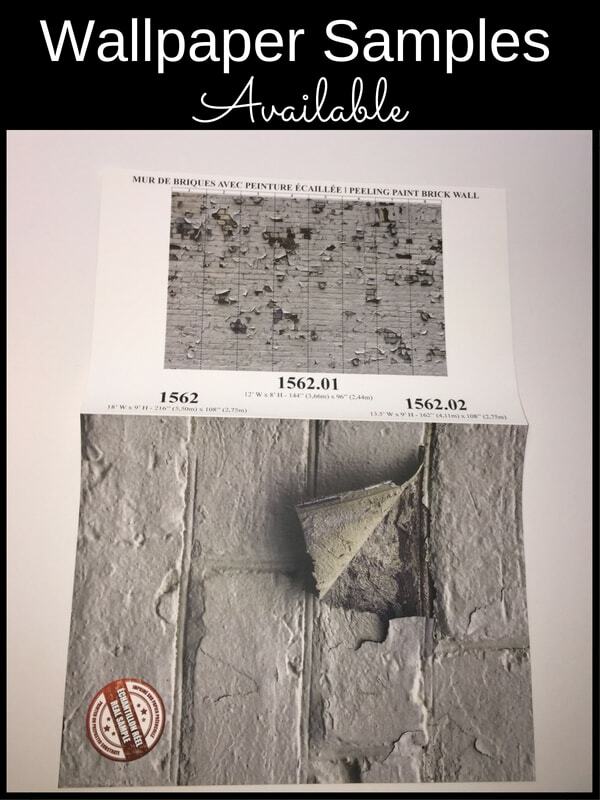 The same process is used for every one of the brick and stone wallpaper murals that I sell. It’s removable – perfect for an office! Do you hate staring at the boring walls at your office? Since my wall murals are removable, they’re perfect for decorating your work space. Your boss can’t give you any grief! 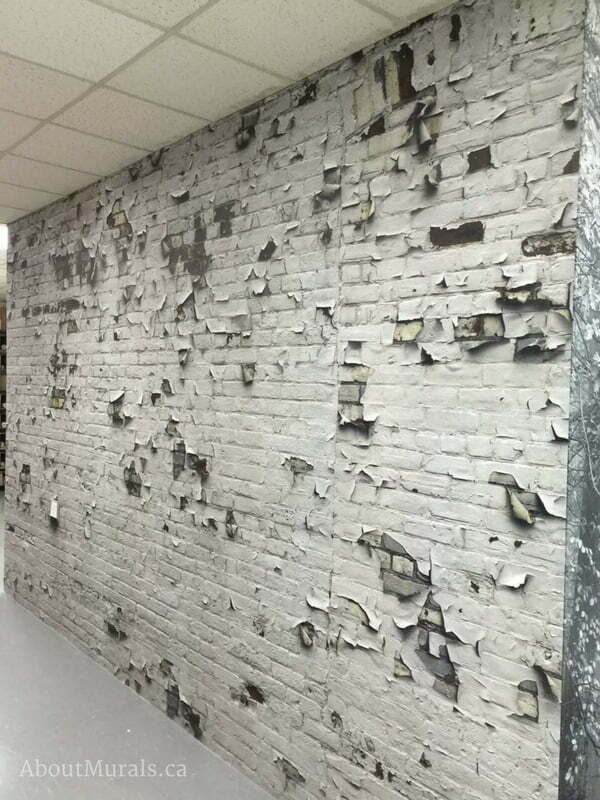 What do you think of this urban brick wallpaper in an office? Yes…it’s easy to hang, too! 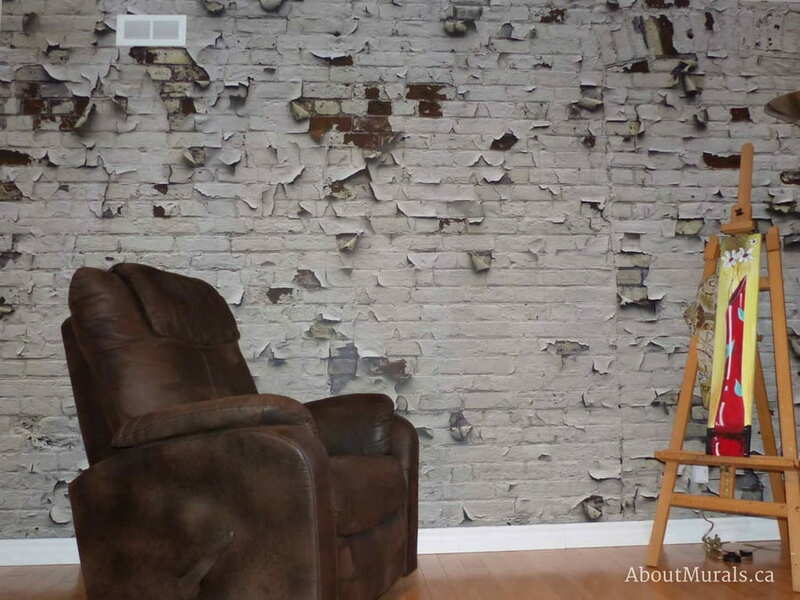 The industrial brick wallpaper creates such a transformation in a room, but it only takes a couple hours to do. For my DIYers, I made a how-to-hang-this-fab-wallpaper video to help you along. If you’d rather hire someone – I have good news! I offer these services in Southern Ontario. If you’re elsewhere, check out the Wallcovering Installers Association for someone in your area. Do you think this client created a cool, lofty feel in this room? Shop all my Brick Wallpaper Now! Grab a sample if you need to see it in person! If you need to see the detail of this industrial brick wallpaper for yourself (up close and personal), maybe you need a wallpaper sample. Why buy your wallpaper from me? My website is SSL secured! See that little padlock with the word “Secure” where my URL is? You can only get that if you’ve become SSL secure! Read a little more about me so you know who you’re working with! Don’t take my word for it! I’ve worked with Colin and Justin, Brian Gluckstein and the Mike Holmes Group. Still not sure? Check out my Google Reviews and Facebook Reviews. Join my newsletter community and I’ll send you all the latest wallpaper sales and coupon codes. You’ll find more customer photos of their wall murals in there too!